Ten June: Mark Your Calendar! 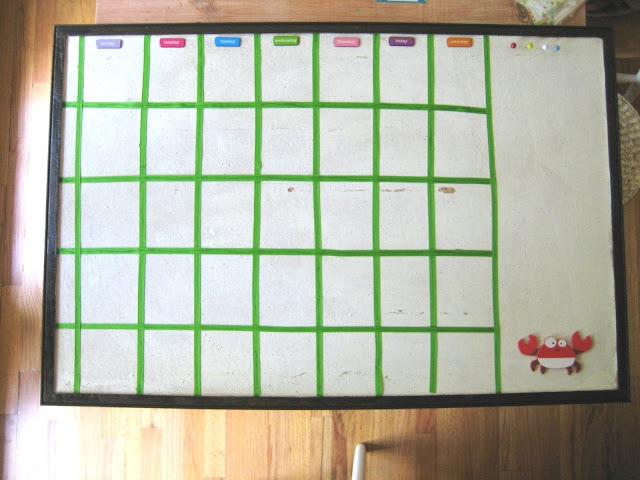 Here's a little story about a DIY calendar. As you read this post, you may think, "Oh, that's a great idea! Michelle was so clever to come up with something like this for her kids." Newsflash: there aren't any kiddos (yet!) in the Ten June crew. Just my slightly minor obsession with staying organized and calendaring my life away. Like, I was that kid who actually liked my chore chart growing up. But anyways, this calendar is a completely kid-friendly project that I did for our kid-less house (well... the pups have a schedule too!). But, of course, Pottery Barn's version was waaaay outside my budget. 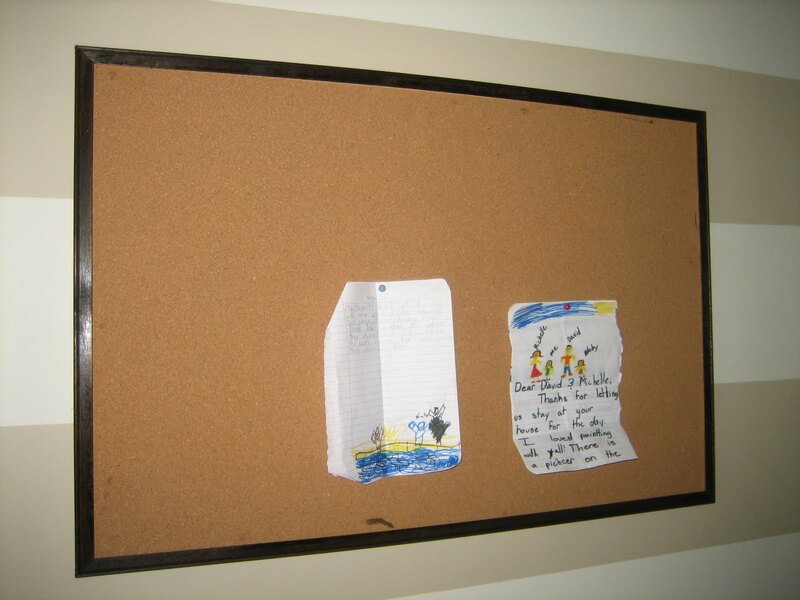 So I took a couple of hints from their catalog and got started with a bulletin board that David has apparently had since his fraternity house days. I had previously stained the outside of the wood frame with dark walnut Minwax. So far, so great, but it looked a little bare. (By the way, how cute are those letters that our nieces sent us!! We love them!) 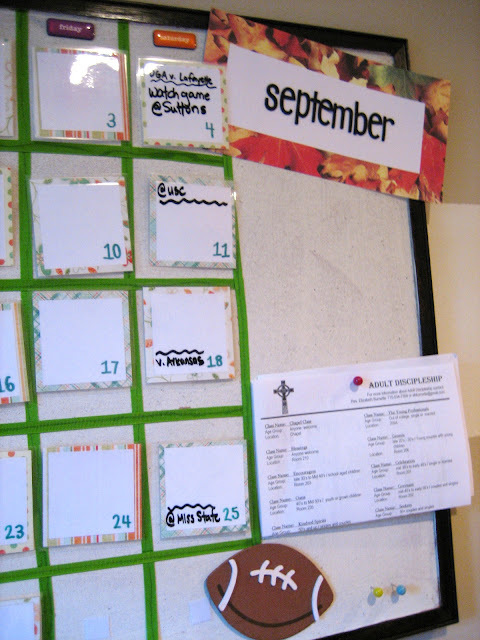 So I painted the cork board part white and added some ribbon to mark the calendar's days. 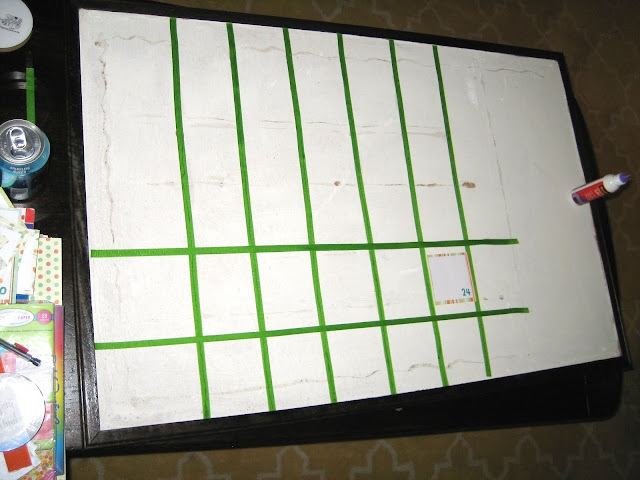 You can actually see in the picture below where I glued down orange ribbon and pulled it up to replace with green. 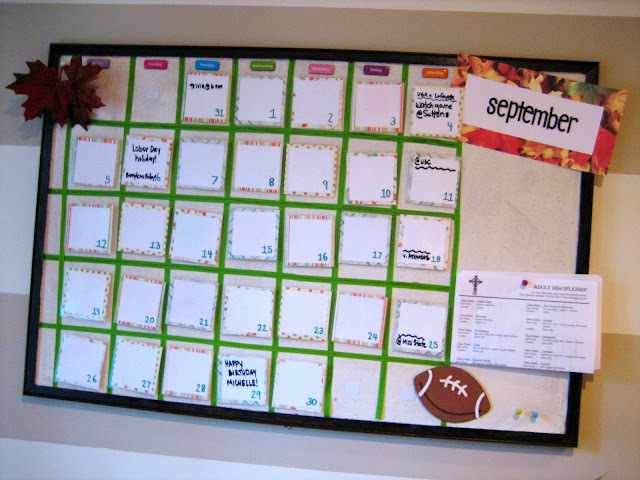 Lets just say we had a "DIY Calendar Project Take Two" when I realized (after spending about an hour measuring out and gluing down orange ribbon) that I didn't really like the orange color in our office. What can I say, we're Dawg fans, so orange doesn't really work in our house! You can see I also left a little bit of space on the side to post other things like postcards or reminder notes. 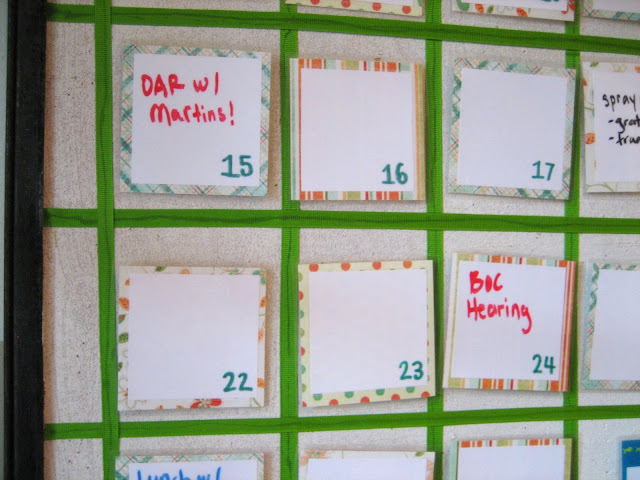 Then I just cut up some scrapbook paper and laminated each square so that you could write (with a dry erase marker) on each day of the month. I attached some good ol' Velcro to the back of each square so I could move the days around according to which month it is. 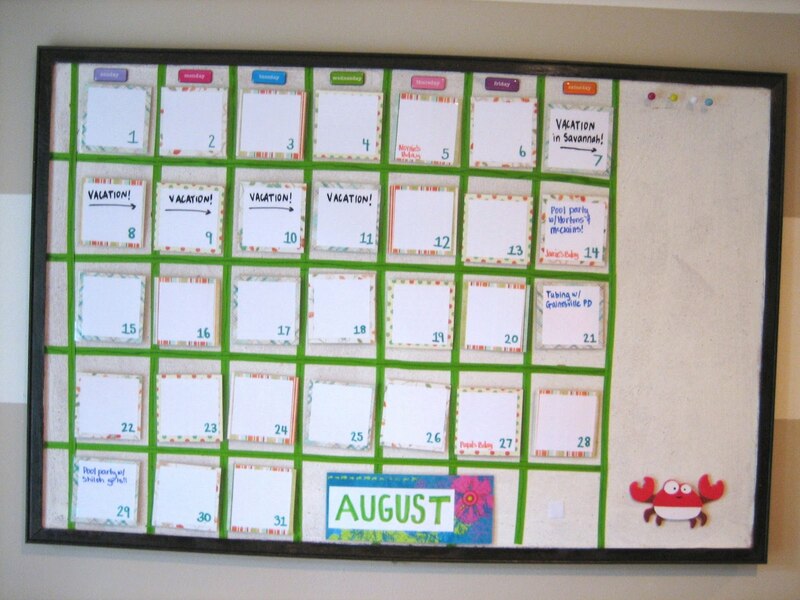 Here are the days Velcroed up on the calendar, ready for the month of August. Okay, now do you see where this project is looking a little kid-friendly?! It's definitely cutesy (wait... doesn't everyone put fake cartoon crabs on their wall calendars to symbolize summer?!) but it makes me smile. Here's an close up shot. Yes, that Board of Commissioners hearing I've got on the calendar for tomorrow does mean that I'll be working until at least 10 PM... so basically, instead of "BOC Hearing" it should read "David, don't forget to call the pizza guy!" I think it fits right in and we're certainly finding it handy to keep our lives on track. 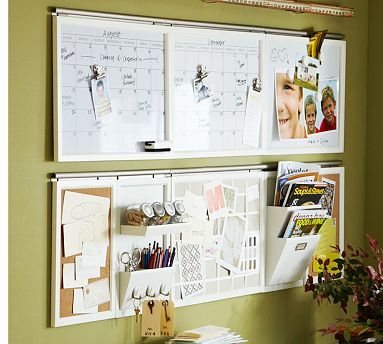 Have you made anything lately that keeps you organized? PS. <<UPDATE!>> Just because I thought it was pretty cute, here is the September version of our new calendar. Happy fall! Wow! You guys are organized "pretty" now:) Love the office walls, too. Cute, and I'm a sucker for post-its. Very cute. I host an organizing party twice a month. The next one is September 1. I hope you can stop by and join. Thats a brilliant idea! I love the velco idea too! How perfect to change out the dates and plans! My calendar would actually look legit every day! We've gone high tech here and are using google calendar because we can both do our own and it puts them together...that way we never double book! For the kids though, this would be really cute in their room and something they would be able to keep! I wonder if they have an aunt that could make it for them????? What colors did you use for the stripes? I love them and have been wanting to do them in my office, but haven't found the right combination of colors. I have swooned over the Pottery Barn calendar for quite some time, but why buy it when I can make one like yours?! Thanks for the great idea! Cute idea!! I love how it looks for Fall. 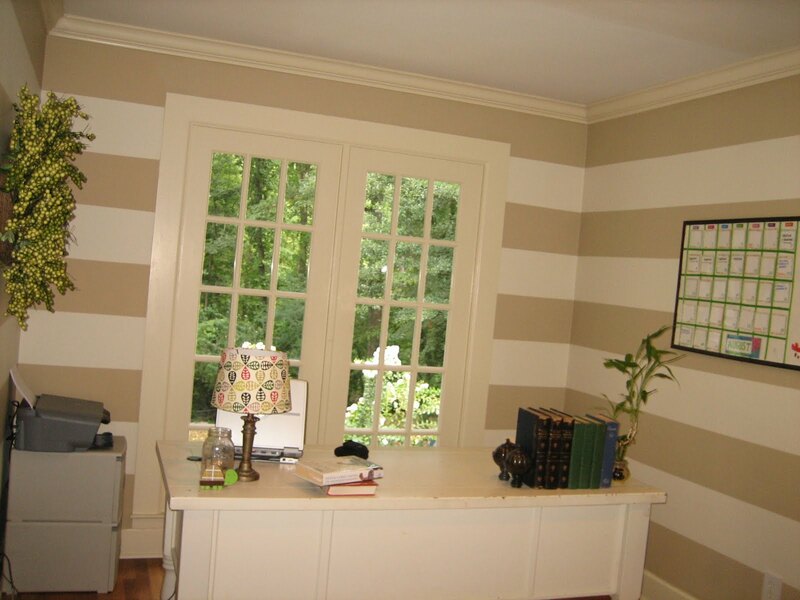 And your office is so fun with the stripes! This is really cute and looks to be very functional! Thanks for sharing!